C&B Weis Painters & Decorators Goomeri and Gladstone - Painting and Decorating. Call C&B Weis For all your painting and decorating needs. Gladstone Goomeri and wide bay area's. We can colour match as well. Or click this Contact Us form. We have teams of painters based in Goomeri and Gladstone and Wide Bay Burnett regions. We are fully licensed and insured to do government and public work. Our services include painting and decorating of new and older homes and buildings in Goomeri, Gladstone and Wide Bay Burnett regions. We are licensed to work with the removal of asbestos and removal of lead paint and the the replacement of broken glass and putty in older wooden windows and doors. We can Colour match your existing paint or recommend a colour scheme for your entire project. 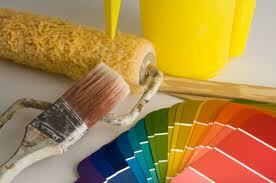 We are a family based painting & decorating business and have been established since 1983. We take the time to ensure you are satisfied with our work and we will give advice on your project if you are unsure of what materials or products might be required.If you require a painting job done contact us as no job is too small. We prefer to use quality Dulux paints for all our painting & decorating jobs. Over the many years we have been painting Dulux paints have been the longest lasting and the most reliable paint we have used .And they fully back their products with after sales service if there is a problem with quality or any thing else. We have tried other brands of paint and some have failed prematurely and most will not give a guarantee . We have had great success over the years with Dulux paints in the Goomeri , to Gladstone and Wide Bay Burnett regions where paint is exposed to a very wide range of temperature and moisture conditions. We use traditional equipment like paint brushes and rollers for a quality job on older materials where the surface can be uneven and the paint needs to be worked in to get proper adhesion and a superior finish. Our painters in Gladstone also use modern equipment like airless spray painting methods for an effective and efficient job on new work . Contact Us for a quote on your next painting and decorating job in Goomeri or Gladstone or Wide Bay Burnett regions.We also supply our own trestles planks, ladders,safety fencing, spray equipment and other resources saving you the associated costs of 3rd party hiring like most other companies these days charge extra for. This alone can add up to huge savings especially in the event of bad weather where you would be charged for hire while the equipment is not being used. Painters & Decorators We also travel to Gladstone, Goomeri,Murgon,Wondai,Woolooga,Widgee,Kilkivan,Tansy,Nanango,Kingaroy, and many other places.